JLBC is a non-profit organization of women committed to promoting voluntarism, developing the potential of women and improving the community through the effective action and leadership of trained volunteers. Being a member of JLBC promotes voluntarism, develops leaders, and inspires a woman to positively impact the Battle Creek community. See how we are impacting Battle Creek for the better. Are you looking to make a difference in your community? Looking to meet new women? Looking to develop more skills or use the ones you already have? JLBC might be a great fit for you! Contact us today for membership information. We are so glad to have you visit our site! We look forward to building a better community with you. Who should become a member of JLBC? Do members have to pay membership dues/fees? What is a meeting like? Do I need to prepare myself for anything? Are there any "rules" that I need to know if I have never been in Junior League before? What will a meeting consist of? Are you looking for a unique way to connect in Battle Creek? Great! We are so glad to have you here. Feel free to take a look around and if you have any questions feel free to contact us. We would love to hear from you. We exist to build a better community together. We want to volunteer in a unique and meaningful way, develop as leaders, and impact our community by volunteering. Our goal is to give and to grow. Hosted by Consumer's Credit Union, JLBC worked in conjution with the Charitable Union for the End Period Poverty Drive. Over 1500 products were collected by the local community. JLBC sent it's Community Impact Vice Presidents to the annual Organizational Development Institute (ODI). This training developers the Junior League members with mission-based training in key areas critical to the healthy functioning of a League. The mission of JLBC is to promote voluntarism, develop the potential of women and improve the community through the effective action and leadership of trained volunteers. It's purpose is exclusively educational and charitable. environments of diverse individuals, organizations and communities. "I love being a part of JLBC. I get to connect with like-minded women who want to build a better community. It's been great meeting new friends and making a difference locally!" - Mandy C.
"I love giving back to my community by volunteering with JLBC! 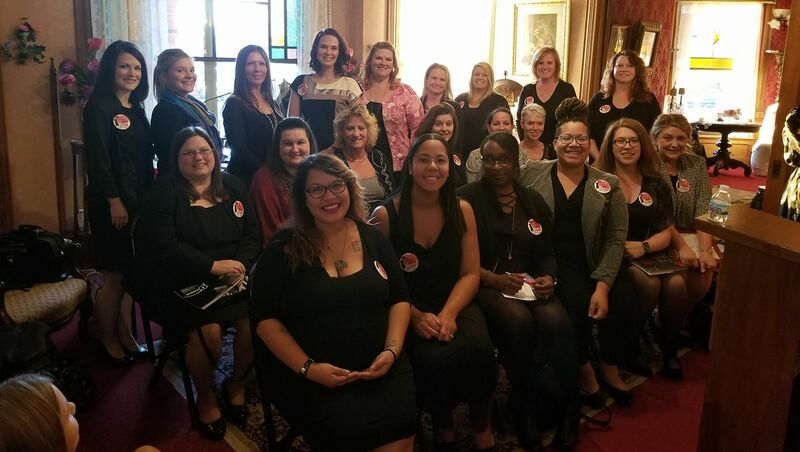 I appreciate that all the women are friendly and constantly building each other up while completing service projects that positively impact Battle Creek." - Mellisa D.
"Hands down, Junior League is one of the most effective organizations training women to be engaged as civic leaders. I have meet women from all over the country and felt extremly tied to the collective work happening within the Michigan Junior Leagues. There are not many spaces that give women the opportunity to take calculated risks and learn in a very experiential way. This has been the best part of my Junior League experience. As a member, you choose to us your own unique skills and talents to help your community. There have been ways that I have longed to learn to better myself and become a better leader and Junior League has helped me cultivate those passions. I don't think any woman that becomes a member can say that she hasn't grown in some unique way."